The Avantco MX20WFB 20 qt. 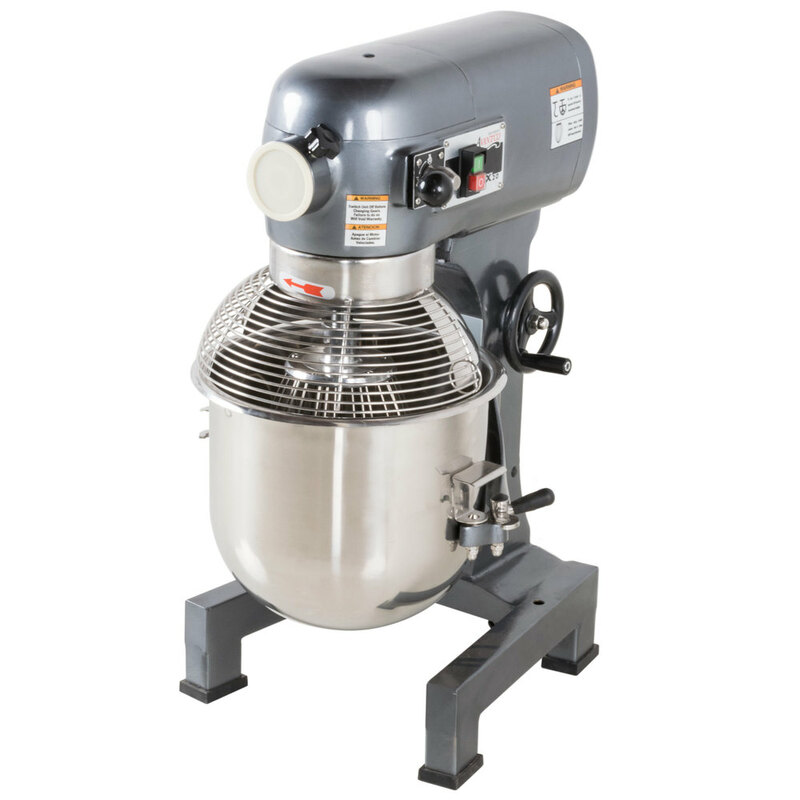 gear driven commercial planetary mixer is perfect for standard duty mixing tasks at your deli or cafe! This 20 qt. 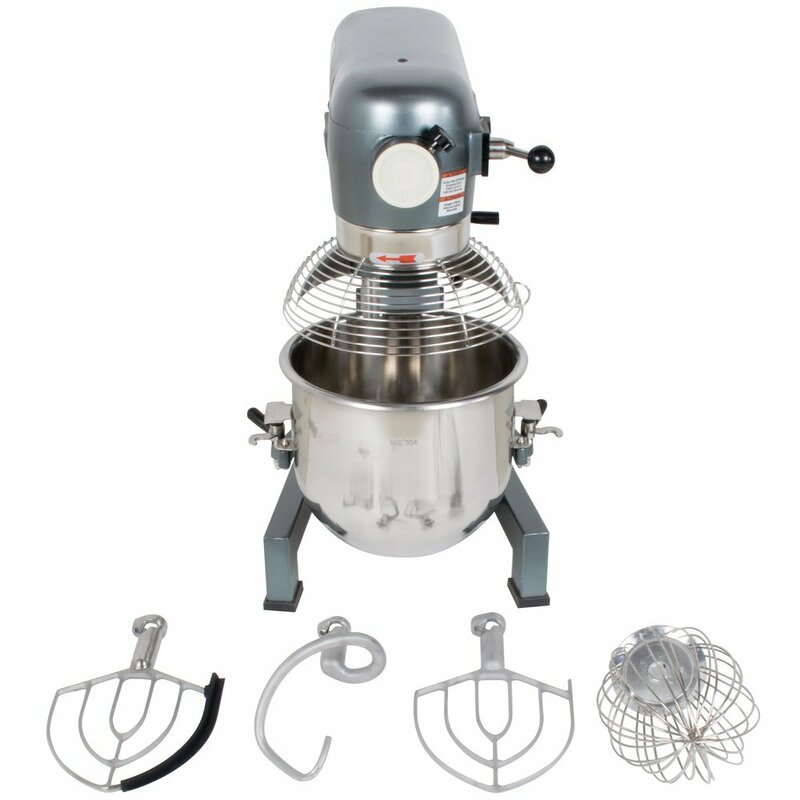 mixer features a powerful 3 speed, 1 hp motor to ensure consistent mixing, even when the bowl is full. The 3 speeds let you mix anything from cake batter to whipped cream, and they are labeled to indicate which attachment is best-suited for that setting. And, a gear-driven transmission design provides greater reliability over belt-driven mixers. This unit comes fully equipped with a type 304 stainless steel mixing bowl to provide greater longevity over comparable models. 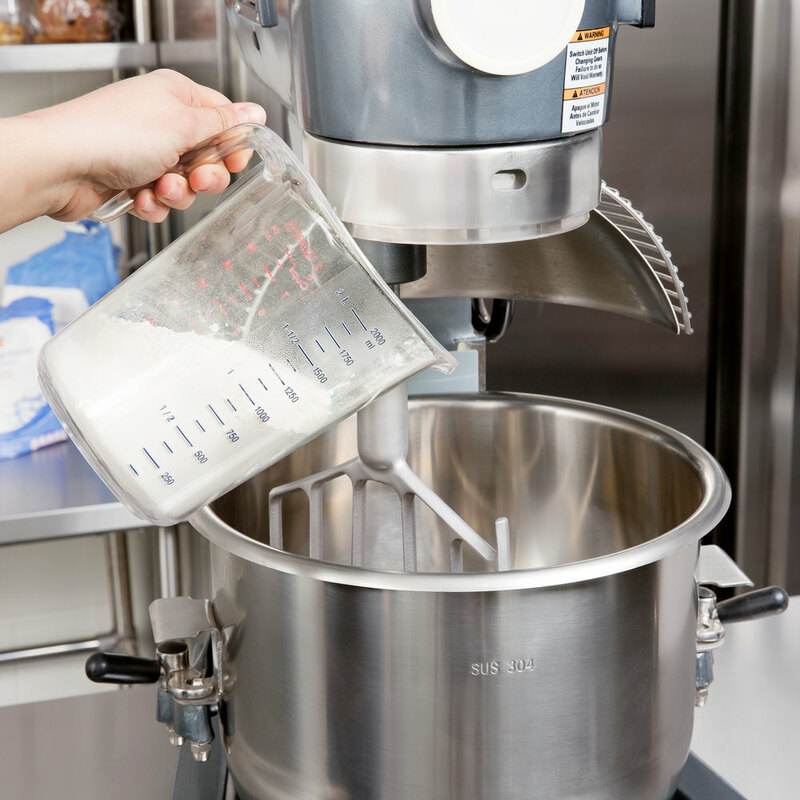 A wire bowl guard helps to prevent fingers and objects from getting caught in the mixer during use, which maximizes safety in a hasty kitchen environment. 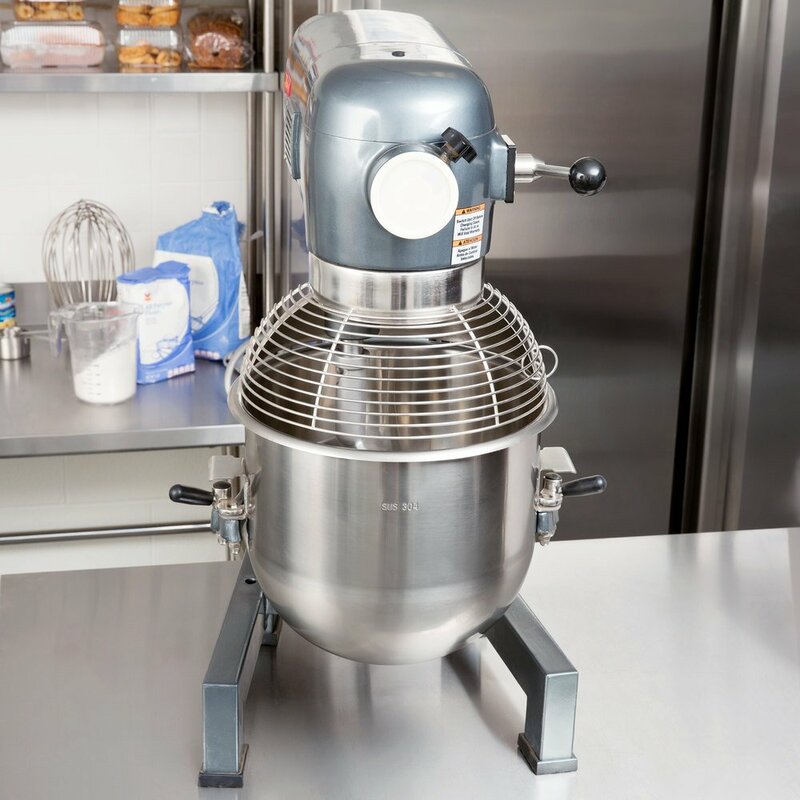 Plus, a stainless steel whip, cast aluminum dough hook, and 2 flat beaters come with this mixer, too, so you can create all of your guests' favorite dishes with ease. One of the flat beaters comes with a silicone scraper blade, so you'll be able to scrape the sides of your bowl as you mix, leaving nothing to waste and making clean up an easier task when finished. This unit features a #12 hub at the top of the unit, which is intended for meat grinder attachments. A 110V electrical connection is required for operation. The motor is definitely more powerful than the regular kitchen aid (great for large batches of dough), and it holds more volume, so it's great for larger batches. Having a startup cafe, we needed all equipment for our cafe. This worked as expected but it's a little bulky for the bowl qt size. It does move around alot when in use. Words can't express how much we love this beater! We are a growing company and make lots of products. This machine is constantly being used and has never given us any difficulty. It's extremely easy to use. Beaters well. Super reliable. This is one huge mixer! I like that it comes with the various attachments - and it's definitely big enough to handle whatever job you have. It comes in a large crate and is very heavy, so pre-plan it's perfect place in your kitchen. This mixer has met our expectations so far. It is of great quality. We use it about everyday and it runs perfectly. The accessories are very good as well. We highly recommend it. The MX20 is a great choice for light to moderate doughs. Make sure you do not change gears while in operation. The four included attachments are more than enough to get pretty much any operation going. We really enjoyed the extra beater with the Teflon scraper that makes sure that the sides of the bowl are incorporated into the dough. This mixer arrived very quickly. It took only 1-2 days. It arrived in perfect condition. I would recommend webstraunt to anyone in the restraunt business. Really big and a pain to put bowl in place but is a powerful mixer and works good for occasional big orders I have. Was a little too big. I should have gotten the smaller one but price was very attractive on this one. You will get your moneys worth out of it. No doubt about it. Honestly this is a professional affordable mixer. But I would go smaller if I could.